We’ve all seen such signs which imply that we will get into trouble if we venture on to a piece of land but what does it really mean? Is it ok to wild camp on a bit of land that doesn’t appear to be used for crops or livestock? ‘The laws of England, Wales and Northern Ireland give landowners the right to exclude us from their land, except for a small fraction consisting of public rights of way and even here we enjoy an entitlement only of passage. The right of exclusion applies equally to forests and mountains, fields and riverbanks, cliffs, quarries and heaths, a 1000 acre parkland or 10 acre meadow. It is enshrined in laws of trespass which provide that if you set foot on British soil you are breaking the law unless the owner of that land has given you permission to be present. These laws entitle a landowner to use ‘reasonable force’ to eject you if you decline a request to leave. 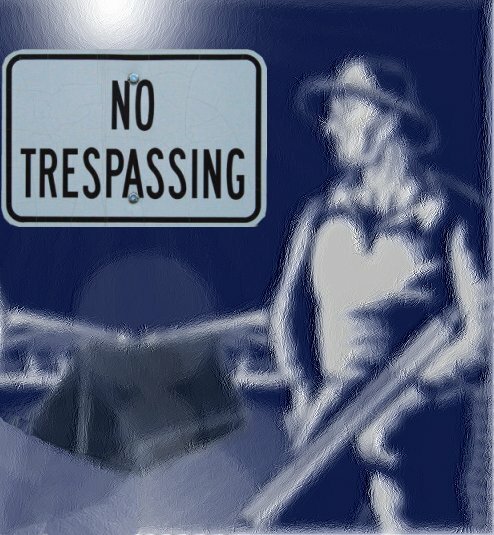 In deterring or ejecting trespassers there are of course limits on what a landowner or somebody acting on his behalf can do. If he uses a considerable amount of force the trespasser may sue him for assault; threatening behaviour such as waving a shotgun at a trespasser can be classed as assault since you do not need to touch somebody to be guilty of this offence but merely to instil in them the fear that they may be physically hurt…If he can demonstrate that the trespass has resulted in financial loss to him then a claim for damages will usually be successful’ – A Right to Roam (Marion Shoard). So to be on the right side of the law you need to seek the landowners permission and in Britain ALL land is classed as privately owned. Although wild camping is tolerated on moorland and mountains in places like The Lake District you can still be prosecuted if you cause any damage, even if that damage is not intentional and may be asked to move on by rangers or landowners at any time.